We have another dwarf planet mission besides New Horizons going on in the solar system - Dawn at Ceres. This mission is orbiting Ceres, the largest object in the asteroid belt located between the orbits of Mars and Jupiter. 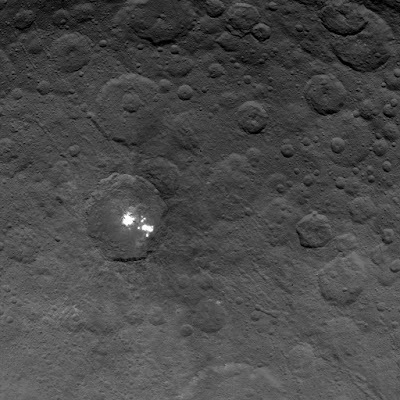 I have blogged about the 'bright spots' at Ceres which has captivated those who have seen them and are following the mission. In an article published today in Nature Ceres' bright spots are discussed or more specifically, a mysterious haze that has been detected above them. Our solar system continues to amaze us.